I´m at the airport ready to board for the US to attend my daughter´s wedding. 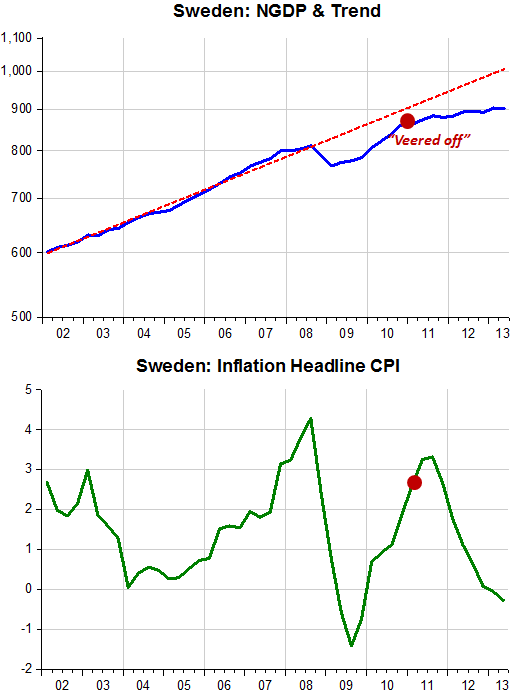 But couldn´t avoid pointing to Svensson´s ‘ire’ towards the sort of monetary policy being practiced by the Riksbank. The Riksbank has neglected the price-stability objective by allowing average inflation to undershoot the inflation target. This has led to higher average unemployment. The Riksbank has thereby not supported the objective of the general economic policy of high employment. Lower average inflation has also led to higher real household debt, and to a higher debt ratio relative to GDP and disposable income. All this in spite of the Riksbank justifying its tight policy by the presumption that the policy would lead to a lower debt ratio than an easier policy would. All in all, the Riksbank is apparently not only neglecting the price-stability objective; it is actually both counteracting the high-employment objective of the Riksdag and the Government as well as increasing household indebtedness. And at one point Sweden was doing so well,,,until it veered off path! What is wrong with central bankers today? They have a squeamish aversion to prosperity, and a peevish fixation on inflation. Should the day of independent central bankers be over? If not, how long will this tyranny of tightness persist? I´m at the airport ready to board for the US to attend my daughter´s wedding.